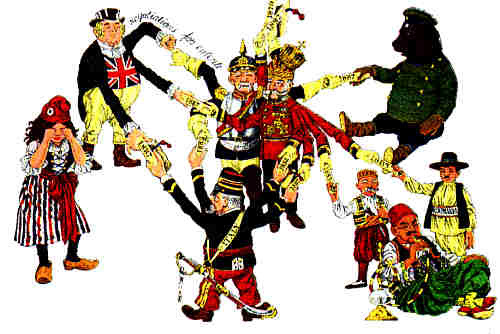 Political cartoon depicting the tangled web of European alliances. In 1906, "the German people would not understand a war for Morocco," as German Chancellor B�low said at the time. But public opinion on both sides was outraged during the 1911 crisis. In the interim, the German people had come to believe that their country was being "encircled" and that measures once thought unthinkable were now necessary. When arrested, Tankosic, a Black Hand member and Serbian army major, was asked why he provided Princip with weapons. "To spite [Serb Prime Minister] Pa�ic," he replied. A final opportunity to limit the expanding war presented itself on Aug. 1. Lichnowsky, the German ambassador to Britain, reported to Berlin on a conversation he had earlier that day with British Foreign Minister Sir Edward Grey. Grey had reportedly assured Lichnowsky that in the event of a Russo-German war, "Britain will remain neutral and would guarantee French neutrality." Grey would later claim that he had been misunderstood.